The path length measurement tool allows to measure the length of linear structures in an image and the area of particles. All segments and closed curves can be exported into a list containing both the coordinates of the reference points, the length of the line segments and the area of the closed polygons. 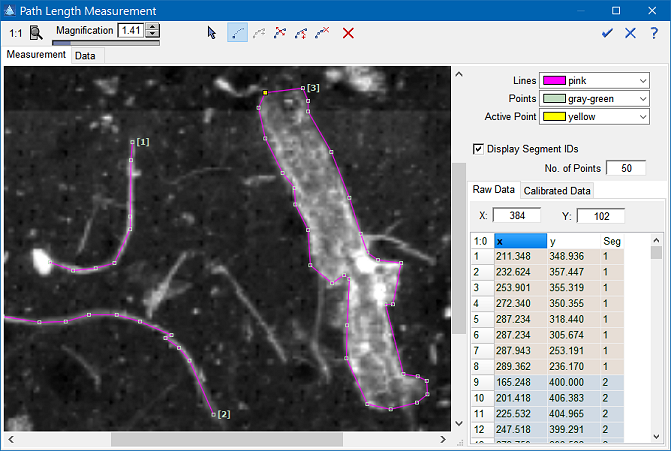 In order to open the measurement tool right-click the image in the 2D imager and select the command "Path Length Measurements" from the context menu. Right-click the image in the 2D Imager and select the command "Path Length Measurements" from the context menu. Draw a path on the image. You can start another path by clicking the "new segment" button. If you want to measure an area draw a line around the area and select "close segment" from the context menu to create the enclosing polygon. Switch to the tab "Data" to see the measured path lengths and areas. The results can be copied to the Windows clipboard for further processing. Hint: Please note that the area of intersecting polygons cannot be calculated.